QiXi Festival comes from the Legend of Niu Lang and Zhi Nü, one of the Chinese four folk legends concerning love. However, good times didn’t last long because Zhi Nü’s deeds were known by the king of the heaven who took her back to heaven. With the cow’s help, Niu Lang flew to heaven along with his two children as they chased their wife and mother. It was just at that moment before he could reach Zhi Nu that the queen of the heaven created a huge river between them. Tears from the two flowed continuously so that even the queen was moved. As a result, she allowed them to meet only on the seventh day of the seventh lunar month every year. 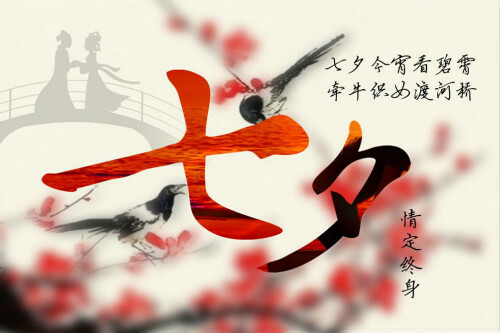 Therefore, the day that Niu Lang and Zhi Nü meet is the present QiXi Festival. For true lovers, What they really care are not the beautiful roses, pure and elegant pearls, gorgeous diamonds, carefully arranged banquet and so on, but is that “I will be always be with you to love, honor, and cherish, for better for worse, for richer for poorer, in sickness and in health.” So TechiSky wants to send the best wishes for all lovers on this QiXi Festival 2018- All Shall be well, Jack Shall have Jill.